Buy 2 for only 22.99 each with Free Shipping! Free shipping on Universal Nutrition Gain Fast 3100 5.1lbs! Buy 2 for only 22.99 each! 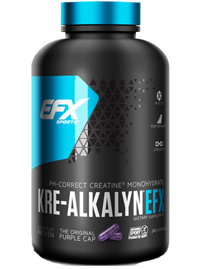 The First Scientifically Engineered Get-Big-Quick Formula! If you turn back the bodybuilding clock, you’ll no doubt remember that old stand by, the “weight gainer.” You probably picked up an economy-sized bottle when you were playing high school football before you became a competitive bodybuilder. Along with the Animal Pak, a quality weight gainer was probably one of the first supplements you ever used. For years, supplement companies sold tons of this stuff. Why? Because it worked. Today, the weight gainer has lost much of its popularity. And over the years, the weight gainer has changed very little. But whether you grew up bodybuilding in the 1980s, 1990s or today, one thing remains certain to bulk up and put on quality muscle weight, you need plenty of calories. And when you cant eat any more, you need more calories. Gain Fast 3100 helps. Big time. For most of us, putting on weight is a simple process (for some, all too easy). Eat more of everything quality protein, whole foods, vegetables, eggs, milk, fruits, good fats, and the like. For others, gaining weight is a difficult proposition. You have a hard time eating every three hours. You always feel full. Maybe you’re a “hard gainer” who can’t seem to put on weight no matter how you try or how much you eat. Gain Fast 3100 has been designed to fuel your body with up to 3100 quality calories per day. But sometimes, even mega-calories arent enough. Sometimes you need something more, something like anabolic boosters, performance herbs, natural plant sterols, EFAs, digestive enzymes, and muscle optimizers. Were talking about ingredients like L-arginine, MCTs, IGF colostrum, L-carnosine, vanadyl sulfate, plant sterols (e.g., beta-sitosterol, stigmasterol, fucosterol, campesterol), inosine, ginseng, pyridoxine alpha-ketoglutarate (PAK), choline, inositol monophosphate, and other good stuff. Where else can you get this kind of formula? Nowhere else in the world. It’s only available in Gain Fast 3100. With Gain Fast 3100s exclusive “Get Big Quick” Formula, you get over 3100 calories from 150g of protein, 596g of carbohydrates, and only 15g of fat. 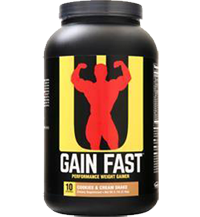 Find out why Gain Fast 3100 is our best-selling weight gainer, bar none. Best of all, Gain Fast 3100 comes in several delicious flavors Vanilla, Chocolate, Pina Colada, and Banana. It also comes in two sizes, 2.55lb and 5.1lb. So when you want to bulk up in the off-season, or you just want to add some quality mass, turn to Gain Fast 3100. Contains: Milk and Soy. Made in GMP facility on equipment that processes milk, soy, egg, peanuts, tree nuts, fish, shellfish, and wheat. These amino acids are naturally occurring from the protein source; they are not added or manufactured. Other Ingredients: Maltodextrin, whey protein concentrate, dextrose, fructose, natural and artificial cookies & cream and chocolate fudge flavors, cellulose, sodium chloride, lecithin, micellar casein, whey protein isolate, vitamin blend (ascorbic acid, dl-alpha tocopherol acetate, niacinamide, D-calcium pantothenate, vitamin A acetate, cholecalciferol, pyridoxine HCl, thiamin mononitrate, riboflavin, dicalcium phosphate, cyanocobalamin, folic acid), acesulfame potassium, and sucralose.